Are you ready for another adorable, yet very late, Christmas card idea? I totally LOVE the big beautiful polka dots in this DSP! Sahara Sand Card Stock 5-1/2" x 8-1/2", scored at 4-1/4"
Polka dot Season of Style DSP 3-1/4" x 4-1/2"
Season of Style DSP 1-1/4" x 4"
This one goes together pretty quickly once you have all the pieces cut. Glue the polka dot Season of Style DSP onto the Whisper White card stock. Glue the red Season of Style DSP onto the bottom of this layer. 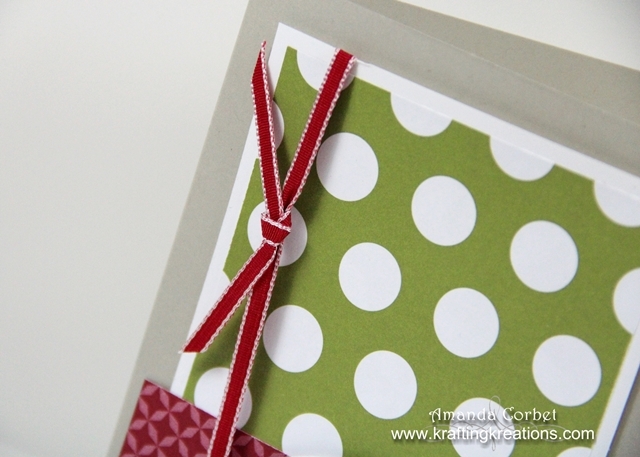 Then wrap the Real Red Taffeta ribbon around the card stock and tie it into a knot and stick this layer onto the card front with Stampin' Dimensionals. For the adorable little birdie stamp the image from For the Birds onto a scrap of Whisper White card stock in Black Stazon ink. Color in the bird with the markers and punch out the image with the XL Oval Punch. Stick this onto the card front with a couple Stampin' Dimensionals and scribble on some Dazzling Details around the bird to make the "ice" sparkle. So cute! I cased this card from somewhere, but I have absolutely no idea where. If you happen to know the original creator let me know so I can give them credit.